April Stary knew she had a passion for real estate from a very young age. While attending college at DePaul University, April purchased her first property at the age of twenty. After graduating with a Bachelors of Science in Finance she immersed herself in the field of real estate. April began her career at a local real estate firm starting as an administrative assistant but was quickly promoted to a Property Manager. Currently, April works as a Senior Property Manager managing commercial shopping centers in various areas of the United States. 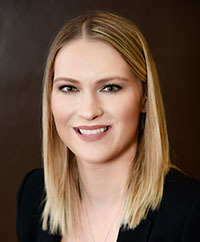 In 2018, April decided to obtain her broker license and join Wenzel Select Properties in order to practice residential real estate. April’s decision to become a real estate broker would further advance her knowledge in the field and allow her to help people on an individual basis. April has lived in multiple Chicago Suburbs throughout the years including Darien, Westmont, Downers Grove, and Lisle. Her familiarity with the surrounding communities and wealth of knowledge will provide potential buyers with a unique insight into various markets. Currently, April resides in Lisle along with her husband Brockton, as well as their two “fur-babies”, Jax and Luna. In her free time, April enjoys traveling, DIY house projects, and sampling new cuisines.